A herb which has tremendous perennial ornamental values in the garden and culinary uses in the kitchen. 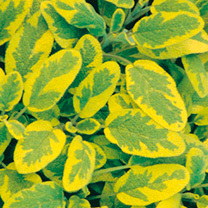 The fragrant foliage is variegated with a lime green centre and golden yellow edge and in summer blue flowers are produced. The leaves have a slight peppery taste and often used to flavour meats often in sauces and stuffings but also to pickles and cheeses. Can also be used for medicinal purposes. RHS Award of Garden Merit winner. Perennial. Supplied in a 9cm pot. Ideal for beds and borders, patio pots and containers. Scented. Grows well in sun or shade.